Miami Beach 411 > Hotels > 2-star > Franklin Hotel in Miami Beach, FL. ¿Hablas Español? This page allows you to find directions, read reviews and make reservations at the Franklin Hotel in Miami Beach. Rather make your Hotel reservation over the phone? Call toll free in the US or Canada: 1-800-573-6351. Rates: Low season from $49. High season from $79. This Beautiful Hotel, with it's Mediterranean facade, fully restored natural wood lobby, and glazed tile floors offers a tranquil oasis from the excitement of South Beach. Valet parking is available, but you can save a few dollars and park at the nearby 7th Street and Collins Ave. garage for a flat rate of $8 per day. 56k dialup Internet access connections are available in the guest rooms. WARNING: Do NOT purchase a tour from the concierge at the Franklin; they are in cahoots with an unprofessional tour operator, who pays them large commissions, which are added to your cost. If you reserve a tour from the concierge, do not be surprised to find a dirty bus, an unprofessional driver, and a boring, inaccurate tour. 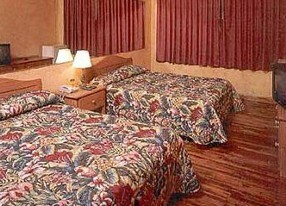 Click HERE for Franklin Lodging Information. • The Franklin is on the Left (West) side of the street. 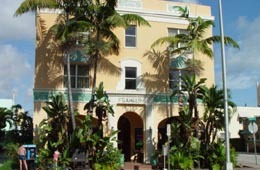 The Franklin is located at 860 Collins Ave., Miami Beach, FL 33139. Use our Miami hotel map to find the exact location. Have questions or prefer to reserve your room over the phone? Call our hotel reservations help desk 24/7.